How do I submit system files with a support ticket when I have an issue with the PC version of a game? If you want to submit a ticket for a PC related issue, you can expedite the process by sending in your dxdiag and msinfo32 system files. 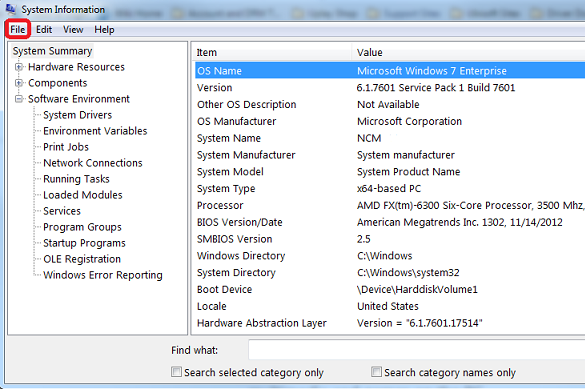 These files report information about system drivers for your video and sound cards, as well as other vital information about your computer hardware that will help us resolve your problem. 1. On your keyboard, press the Windows Key and the R Key (Win+R) at the same time. 2. In the Run box that pops up, type dxdiag and click OK.
3. 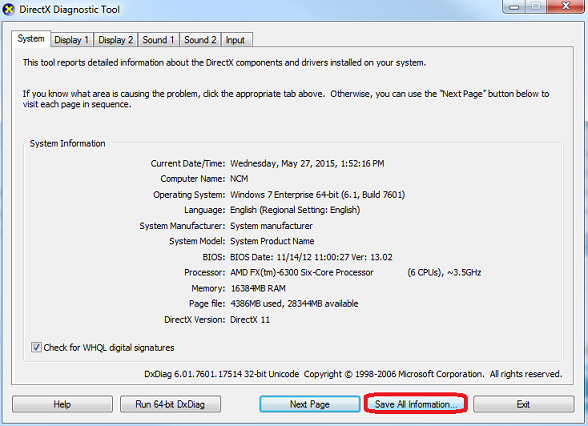 Once the DirectX Diagnostic Tool is open, click on the Save all information... button. 1. Press the Windows Key and the R Key (Win+R) at the same time. 2. In the Open box, type msinfo32 and click OK.
3. When the System Information program comes up, click on File and select Save. 4. Click the Save button to save the file as an NFO file to your Desktop. Note: Be sure to save use the NFO file type! 2. Type in your Uplay Account credentials and click Log In. 3. Input your Platform (PC), the Game, and then the Category that describes the issue you're having. 4. Type a brief summary in to the Subject field. 5. Type a description of the issue you are experiencing in the How can we help you? section, including any troubleshooting you have done so far. 6. 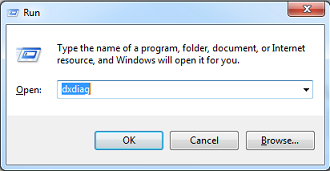 Under Attach documents, click +ADD FILES and find the dxdiag.txt you saved earlier, then click Open. 7. Click +ADD FILES again to add the MSINFO32 file. 8. Scroll down, and click SUBMIT MY CASE. 9. At this point, you should receive a message stating that your question has been submitted, along with a reference number. 10. To confirm you submitted a ticket, you can click on MY CASES under the top right menu button to see your ticket.